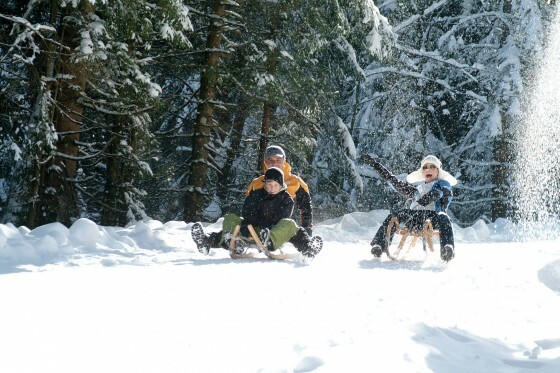 Numerous tobogganing runs are waiting for you in the close vicinity of Faistenau in Austria. Enjoy a hike for example to a rustic Alpine chalet, treat yourself to a tasty snack, and whizz down to the valley on a toboggan after sampling Austrian specialities. An exciting adventure for the entire family in the Austrian Alps. There is also a short toboggan track next to the Snowtubing. If toboggans are needed, please rent at Sport Auer. In winter this hiking path turns in a 1,5 km long tobogganing run. The track is not always cleared, please call the tourist office for further information: 0043 (0) 6226/83 84 41. 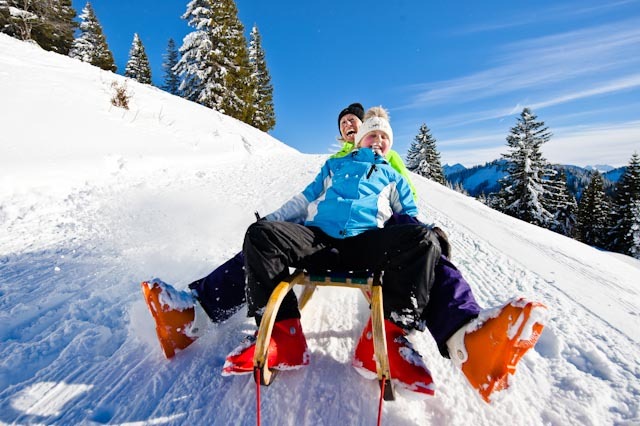 The 2 tobogganing possibilities up to the mountain Schafberg in Faistenau are regularly cleared and our most popular runs. But it is also the street up to three houses, were sometimes cars come your way. Make sure, you’ll be careful in that case, length about 2 km. You can rent tobagganing at the Schlittenhütte € 3,00 – Tel. : +43 (0)664 / 9739369. Food and drink you get also at the Grögernalm – Tel. : +43 (0)664 / 88622752. A natural toboggan track starts from the end of Tiefbrunnau street, it’s the hiking path to Sausteigalm in summer and is approximately 2,5 km long. As the alpine hut “Sausteigalm” has no regular opening hours, the track is not always cleared, please call the manager in advance. mobile: 0043 (0)664/1247380 or 0043 (0) 664/9910059. You are using our toboggan tracks on your own risks, traffic rules are valid!